This Sunday, December 10, 2017, Art Basel’s 16th edition in Miami Beach closed following strong sales across all levels of the market and robust attendance from international collectors and institutions. This year’s show saw the debut of a new floor plan and show design, which was widely praised by exhibitors and collectors alike. The show, whose Lead Partner is UBS, featured 268 premier galleries from 32 countries, who presented outstanding works, ranging from Modern masterpieces to contemporary painting, sculpture, performance, photography, works on paper and film – some of which were created specifically for the fair. Across the five show days, the fair attracted an attendance of over 82,000, including influential collectors, directors, curators, trustees and patrons of leading international museums and institutions such as: Albright-Knox Art Gallery, New York; The Andy Warhol Museum, Pittsburgh; Baltimore Museum of Art; Brooklyn Museum, New York; Contemporary Arts Museum Houston; de Young Museum, San Francisco; Detroit Institute of Arts; Fridericianum, Kassel; Hirshhorn Museum and Sculpture Garden, Washington, D.C.; Musée d’art contemporain de Montréal; Museo de Arte de Lima; Museo de Arte Latinoamericano de Buenos Aires; Museum of Contemporary Art Chicago; Museum of Contemporary Art Cleveland; Museum of Contemporary Art Toronto Canada; Museum of Fine Arts, Boston; Nasher Sculpture Center, Dallas; New Museum, New York; Philadelphia Museum of Art; Serpentine Galleries, London; Solomon R. Guggenheim Museum, New York; Tate, London; The Museum of Modern Art, New York; Ullens Center for Contemporary Art, Beijing and Whitney Museum of American Art, New York. As a result of the ongoing renovation of the Miami Beach Convention Center (MBCC) – due to be completed in 2018 – the 2017 show featured a completely redesigned exhibition layout, comprising a new floor plan, 10 percent more exhibition space, wider aisles, a broader range of booth sizes and larger lounge areas. The fair presented 10 galleries that graduated into the main sector of the show this year, and introduced 20 new exhibitors who were part of Art Basel in Miami Beach for the first time, including: A arte Invernizzi, Anat Ebgi, Antenna Space, Applicat-Prazan, Ceysson & Bénétière, Chapter NY, David Lewis Gallery, dépendance, Galeria Jaqueline Martins, Hales Gallery, Inman Gallery, Isla Flotante, Múrias Centeno, Offer Waterman, Patron, Ricardo Camargo Galeria, Richard Saltoun Gallery, Takuro Someya Contemporary Art, Taro Nasu and Tyler Rollins Fine Art. This edition of the show featured 198 of the world’s foremost galleries in the main Galleries sector, presenting the highest quality of painting, sculpture, drawing, installation, photography and video works. A strong list of returning exhibitors was joined by 47 Canal, Bureau, Garth Greenan Gallery, Kalfayan Galleries, Galeria Leme, Peres Projects, Galeria Plan B, Sfeir-Semler Gallery, Jessica Silverman Gallery and Tokyo Gallery + BTAP, who graduated from the show’s Nova, Positions or Survey sectors. Highlights in the Galleries sector included a wall installation of works on paper by Sol Lewitt (b. 1928, d. 2007) and floor sculptures by Carl Andre (b. 1935) at Paula Cooper Gallery, a solo presentation by Ugo Rondinone (b. 1964) at Galerie Eva Presenhuber and Ellsworth Kelly’s (b. 1923, d. 2015) ‘Sumac’ at Lévy Gorvy. Edward Tyler Nahem Fine Art’s booth featured a large-scale multimedia painting by Robert Rauschenberg (b. 1925, d. 2008) that was originally commissioned by the National Endowment for the Arts in 1979. Galerie Thomas Schulte presented an immersive hanging of Allan McCollum’s (b. 1944) ‘Each and Every One of You’ from 2004, which consists of an inventory of male and female first names taken from the United States census, printed with ink on paper and installed in the order of popularity. Poignant works engaging with politics, race, gender and social issues had a strong presence in the Galleries sector. Works widely commented upon included a new painting by Peter Saul (b. 1934) entitled ‘Donald Trump in Florida’ at Mary Boone Gallery, works by Carolee Schneemann (b.1939) and Betty Tompkins (b. 1945) at P.P.O.W., several strong works by LaToya Ruby Frazier (b. 1982) at Gavin Brown’s enterprise and a video work by Fiamma Montezemolo (b. 1971) at Magazzino. Susanne Vielmetter Los Angeles Projects offered both a large-scale painting and a wall installation made from 28 stacks of plastic cups and wooden shelves by Pope.L (b. 1955), while Goodman Gallery featured an installation by Zimbabwean artist and activist Kudzanai Chiurai (b. 1981). In its fifth year, Edition – Art Basel’s sector for works in multiples or prints – spotlighted 11 galleries: Alan Cristea Gallery, Crown Point Press, Gemini G.E.L. LLC, Sabine Knust, Carolina Nitsch, Pace Prints, Paragon, Polígrafa Obra Gràfica, STPI, Two Palms and ULAE. Featuring 29 exhibitors this year, the Nova sector provides galleries with a platform to present new work by up to three artists. First-time exhibitors in the sector included: dépendance, with drawings, sculpture, paintings and film by Ed Atkins (b. 1982), Gillian Carnegie (b. 1971) and Peter Wächtler (b. 1979); David Lewis Gallery, with works by Dawn Kasper (b. 1977) and Lucy Dodd (b. 1981); and Tyler Rollins Fine Art, with a never-beforeseen installation by Manuel Ocampo (b. 1965), reflecting on current global political events. David Castillo Gallery presented photographs by Lyle Ashton Harris (b. 1965) and Xaviera Simmons (b. 1974), as well as a live performance by Kalup Linzy (b. 1977), all of which raise urgent questions about representations of race, sexuality and gender in today’s society. In Proyectos Monclova’s booth, Tercerunquinto (established 1996) staged a performative work, painting Mexican political campaign murals directly onto the walls, which was accompanied by a new video, alongside the film’s storyboard. Mor charpentier’s project was centered around memory, forgotten violence and hidden narratives, presenting works by Rosângela Rennó (b. 1962) and Teresa Margolles (b. 1963) that aim to increase awareness of events that both governments and history do not publicize. Major projects by single artists were featured by 14 exhibitors in Positions. Highlights from the sector included sculpture and video works by Carl Mannov (b. 1990) at Christian Andersen; a new series of ceramic pot sculptures and typographic prints that examine how religious activities have influenced Chinese society by Xu Qu (b. 1978) at Antenna Space; an installation and daily performance by Adam Gordon (b. 1986) at Chapter NY; and a new body of work by Harold Mendez (b. 1977), including a wall-based mural and floor sculptures, at Patron. Three artists in the sector, A.K. Burns (b. 1975) at Callicoon Fine Arts, Jamal Cyrus (b. 1973) at Inman Gallery and Mariela Scafati (b. 1973) at Isla Flotante, were shortlisted for the next BMW Art Journey, a juried award that enables emerging artists to go on a journey of creative discovery of their choice. The winner will be announced in early 2018. Featuring presentations of rarely seen works from before 2000, Survey consisted of 16 exhibitors, seven of which were completely new to the Miami Beach show. This year’s sector featured early drawings by the artist and activist Judith Bernstein (b. 1942) at The Box and pieces developed during Augusto Pinochet’s dictatorship in Chile by seminal Chilean artist Carlos Leppe (b. 1952, d. 2015) at espaivisor. Additional projects in Survey included a recreation of Brazilian painter Wesley Duke Lee’s (b. 1931, d. 2010) studio at Ricardo Camargo Galeria; a specially curated booth devoted to the alternative and innovative forms of painting that emerged in Milan during the 1950s and 1960s at A arte Invernizzi; important early works by renowned African American artist and historian David Driskell (b. 1931) at DC Moore Gallery and a focused display of paintings and sculptures by British modernist William Turnbull (b. 1922, d. 2012) at Offer Waterman. 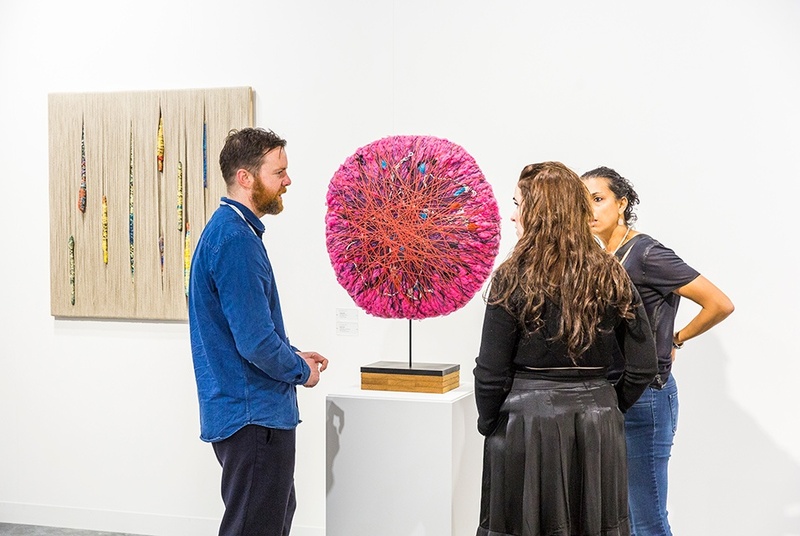 Always a popular highlight of the show, Kabinett consisted of 25 carefully curated exhibitions within booths across the fair. This year, more than half of the participants featured work by female artists including Etel Adnan (b. 1925) at Sfeir-Semler Gallery, Anni Albers (b. 1899, d. 1994) at Alan Cristea Gallery, Andrea Bowers (b. 1965) at Andrew Kreps Gallery, Colette Brunschwig (b. 1927) at Galerie Jocelyn Wolff, María Martínez-Cañas (b. 1960) at Fredric Snitzer Gallery, Farida El Gazzar (b. 1975) at Kalfayan Galleries, Brigitte Kowanz (b. 1957) at Galerie Krinzinger, Grete Stern (b. 1904, d. 1999) at Jorge Mara – La Ruche and Haegue Yang (b. 1971) at kurimanzutto, among others. For his first year curating the Public sector in Collins Park, Philipp Kaiser selected 11 ambitious site-specific installations by both established and emerging artists. This year’s edition of Public was centered around the theme ‘Territorial’ and showcased works by Frida Baranek (b. 1961), Yto Barrada (b. 1971), Daniel Buren (b. 1938), Abraham Cruzvillegas (b. 1968), Philippe Decrauzat (b. 1974), Noël Dolla (b. 1945), Cyprien Gaillard (b. 1980), Daniel Knorr (b. 1968), Harold Mendez (b. 1977), Manuela Viera-Gallo (b. 1977) and Brenna Youngblood (b. 1979). Additionally, Jim Shaw (b. 1952) and his D’red D’warf band premiered the much anticipated progressive rock opera ‘The Rinse Cycle’. David Gryn, Director of Daata Editions and London’s Artprojx, once again curated the show’s Film program, which brought together works that examine the diverse and global language of dance, including short films by Jibade-Khalil Huffman (b. 1981) and Jen DeNike (b. 1971), as well as a new immersive sound work based on electronic dance music by Hans Berg (b. 1978). Returning to the show for her third year, New York-based film curator Marian Masone selected the feature film ‘Boom For Real: The Late Teenage Years of Jean-Michel Basquiat’ (2017) directed by Sara Driver (b. 1955), which was screened at the Colony Theatre on Friday during the fair. Art Basel’s celebrated Conversations program, which attracted over 1,000 visitors throughout the course of the show, offered dynamic discussions between artists, gallerists, art historians, writers, museum directors and collectors from across the globe. The program began with the Premiere Artist Talk, which saw Charles Gaines (b. 1944) in conversation with Brian Stevenson, Executive Director, the Equal Justice Initiative, and Naima Keith, Deputy Director, Exhibitions and Programs, California African American Museum. ‘Is Culture in the Americas in Big Trouble?’ addressed the current threats to art and culture in the midst of a major conservative shift in politics and changes in economies, while ‘Is Innovation Enough for Middle-Market Galleries?’ explored the rise of new itinerant gallery models and communal sharing systems. Image : Alison Jacques Gallery’s stand at the Art Basel Miami Beach fair © Art Basel.